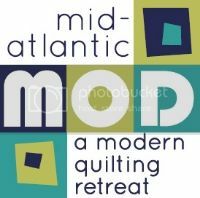 Philadelphia Modern Quilt Guild: Spotlight on... CANDI! Hello all!! Hope everyone enjoyed their holiday weekend (in the US, anyway) and is doing their best to beat the summer heat. I had the pleasure of meeting Candi Weinrick in person at the last guild meeting where we came up with an idea - include a photo of the spotlighted. Not sure why this didn't come to me sooner, but hopefully this will help with our mixing and mingling at all our future events. And with no further ado - here's Candi! Tell me a bit about yourself: name, location, affiliations, personal stuff. Candi Weinrick, Logan Twp NJ, married almost 20 years, 2 children (a daughter in college and a son in high school). 1 dog, 1 cat, 1 fish, 3 snails and various baby wild animals that show up in our yard - most recently a nest of 8 baby bunnies and a baby bird. We call our house Wild Kingdom. I work full time for a major brokerage firm. I'm a Registered Assistant to a Financial Advisor. My 2 friends and 1 were in a cross-stitch store and heard someone talking about a quilt shop on the other side of the shopping plaza. We literally ran over there and it was love at first fabric sighting. We took a basic class and were hooked. That was about 10 years ago. I actually remember her name - Diane from the quilt shop (A Patch of Country in Glen Mills PA), that shop is no longer there. Piecing. I love piecing. LOVE. I don't know if its the hardest, but I definitely hate cutting the fabrics. I really just want to get to the meat of the project. I have no idea! lol. I just kinda have them floating around in my head, either by block type or the fabric dictates the quilt. I'm lucky enough to have a sewing space in our 4th bedroom. It's all mine. We recently attached a design wall and the closet has shelves that I use to store my fabric. I have a Viking sewing machine and want a mid-arm machine. I would say about 10 - 15 hrs. I name them but I have never made a label. It depends on the project and who I'm making it for. My favorites are pinks and greens. I buy quite a bit online too - Hancocks of Paducah, Pink Chalk Fabrics, and various Etsy shops. Usually - but I keep it simple. I love traditional patterns made from modern fabrics. Thanks, Candi, for taking the time to let us in on your quilting world! It's great to meet a fellow guild member and I hope you all enjoyed it as much as I did. Enjoy the rest of the week and we'll be back in two Thursdays with the next spotlight! It is certainly nice to have a face to go with the name! I am glad you thought of that. I love your description of your home! Beautiful quilts and wonderful color choices in the last one! You reminded me of a friend of mine who was an avid cross stitcher. Once she joined our quilting group and started quilting, she made more quilts than any of us that year and actually hand quilted them! Thank you for sharing your love of quilting. Nice to meet you, Candi! What fun and lovely quilts! Looking forward to meeting you and more of us at the next meeting. I haven't been able to make one yet, but it WILL happen. Happy crafting to you! That Hexagon quilt is pure genius--looks challenging to piece, tho! Tell me there's a trick to avoid set-in seams! Candi, your quilts are wonderful!!! Thank you all for the kind comments and a special thanks to nicole for interviewing me!